From the mind of New York Times #1 bestselling author Neil Gaiman comes a new world filled with dreams, nightmares and wonderful characters living together in a shared universe for a new story unlike anything we've ever seen before. A rift between worlds has opened, revealing a space beyond the Dreaming. Meanwhile, a book from Lucien's library is discovered by a group of children in the waking world where it should not exist. Lucien calls for Matthew the Raven to seek out their master, Daniel, Lord of Dreams. As Matthew flies across the Waking World and others, he finds a young boy named Timothy Hunter who, in his dreams, has become the world's most powerful magician-but in his nightmares he is the world's greatest villain. A new House has appeared in the realm of the Dreaming: the House of Whispers, with its proprietor, a fortune-teller called Erzulie. And elsewhere, Lucifer has fallen again, only this time he might be trapped in a Hell of his own design. 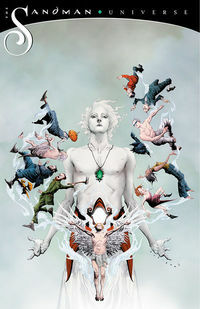 Spiraling out of this special issue will be four all-new series set in the Sandman Universe. It all starts here! Legal Notice: Entire contents trademarked (® or TM) and copyrighted (©) 1986-2019 by Things From Another World, Inc. and respective copyright and trademark holders. All rights reserved. Page rendered at 2019-04-19 07:52:29 in 0.235 seconds.